Terrence Wise, right, stands in the crowd rallying for higher minimum wage. Wise has been a leader in the #Fightfor15 movement sweeping the nation. He recently had the opportunity to introduce President Barack Obama at a White House forum on labor issues. 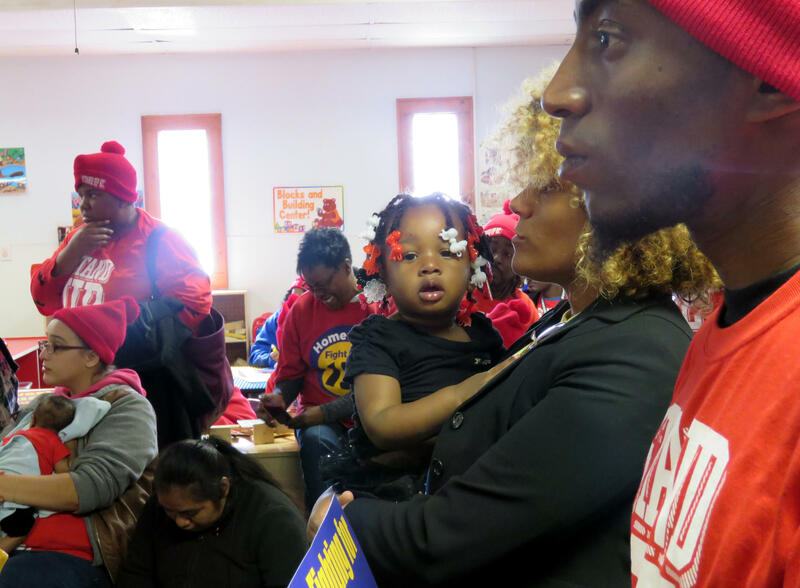 Kansas City-area childcare workers joined the minimum wage fight Tuesday with a rally and protest at a childcare center on Troost Avenue. The workers used the event at UBUNTU to publicly join the "Fight for 15," a national movement raise the minimum wage to $15 per hour. Twenty-five year old student and nurse Lajua Manning was among a handful of women that spoke to the crowd. With her daughter Rayaira on her hip, Manning told the crowd she works hard to make her lifestyle and career work. As a single mother, she cares for her daughter during the day, works 40-hour weeks as a nurse overnight and goes to college full-time. "I takes a lot to take care of a kid, to care for families," Manning said. "They are precious and delicate, and it's constant work." Kim DeVries, an assistant teacher at Head Start Preschool, spoke about the $90,000 of debt she took on just earning the certification to teach. Three years into her teaching job, she makes $10.32 per hour — a wage, she says, that is far under what she and other caretakers deserve. 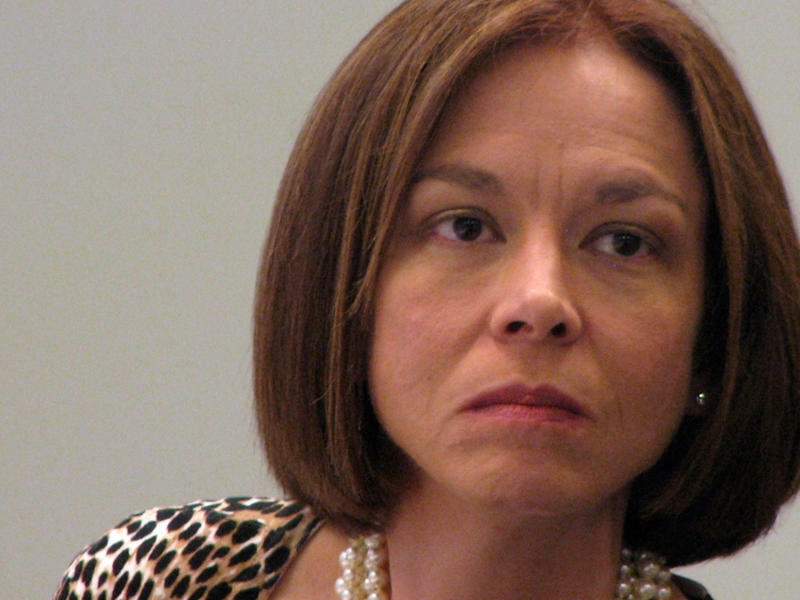 "A lot of people see my job as glorified babysitter," DeVries says. "[But] I am teaching children their most basic skills in life, that set them up to be citizens in this country." The noontime rally was one of multiple events in Kansas City on Tuesday. Fast-food workers went on strike at the McDonald's at 32nd and Main Street before sunrise. After the rally at the child care center, protesters also planned to march to City Hall, where they would gather again in the evening. McDonald's worker Richard Eiker, who is also a spokesperson for the minimum-wage activist group Stand Up KC, says he feels hopeful about where the campaign is headed. "We're going to use our strength in numbers and organization in the ballot box," Eiker said of his group's efforts to get the protestors registered to vote. "It's only through our numbers that we can make effective change in a democracy." There are roughly 2,300 child care providers in Missouri that don't have to follow any kind of health and safety regulations – a huge problem for parents trying to find suitable day care for their children. "There are some folks out there who, either through negligence or circumstance, should not be in the business of providing child care," says Missouri Gov. 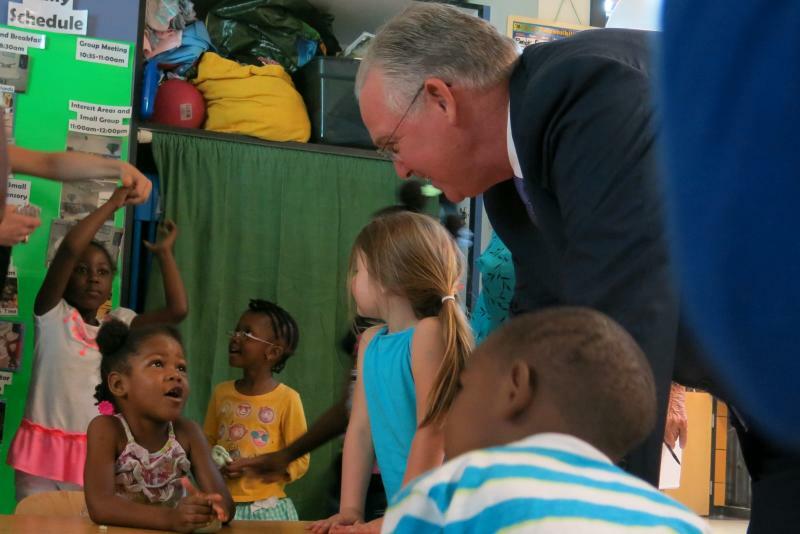 Jay Nixon, "and there's very little to stop them from setting up a sign, throwing a swing set out back and calling themselves a childcare provider." It's been a year since the Service Employees International Union started organizing protests calling for the fast food industry to adopt a minimum wage of $15 an hour. The union says that workers will strike in 150 cities on Thursday, but, as Anne Mostue of WGBH reports, few workers are actually leaving their shifts.